Jean PERLIER II (1669 – 1723) was Alex’s 8th Great Grandfather; one of 512 in this generation of the Miller line. Jean Perlier II was born 3 Nov 1669 in La Treamblade, Charante, France. He was a Huguenot and immgrated with his parents Jean PERLIER I and Marie ARNAUD and brother Andre. He married Anne REZAEU on 25 Oct 1696 in New York at l’Eglise Francoise a la Nouvelle York, by the minister Monsieur Payret (Peiret). Jean died in Fresh Kill, Staten Island, New York, 14 Sep 1723. Jean made a freeman of New York City on December 16, 1695. He was a ship carpenter by trade. 12 Jan 1701 – Jean Perlier and Marie Naudin were godparents to Pierre Galeau and Susanne Boisons’ daughter Marie. 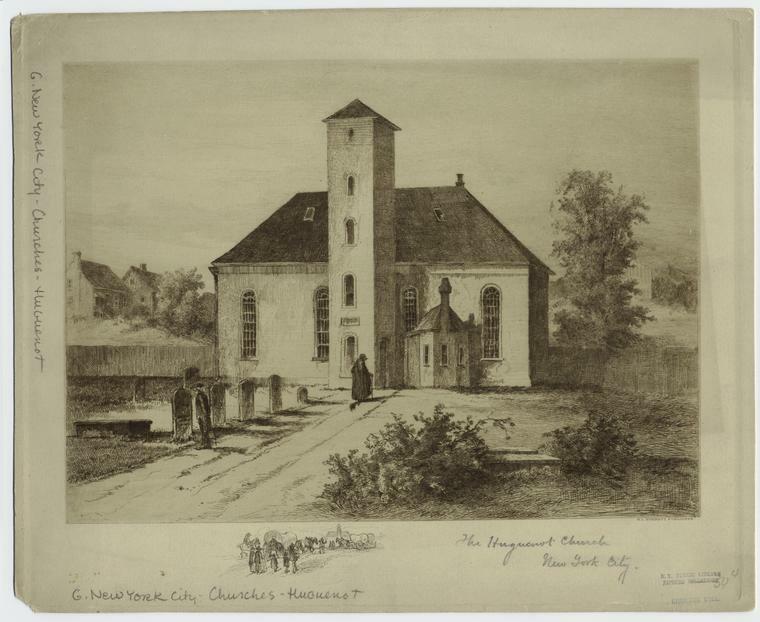 The Huguenot congregation was formally established in 1628 as L’Église française à la Nouvelle-Amsterdam. This parish continues today as L’Eglise du Saint-Esprit, part of the Episcopal (Anglican) communion still welcoming Francophone New Yorkers from all over the world. Services are still conducted in French for a Francophone parish community, and members of the Huguenot Society of America. There was Huguenot settlement on the south shore of Staten Island, New York in 1692. The present-day neighborhood of Huguenot was named for those early settlers. By 1695 the population on the Island was divided evenly amongst the French-speaking people, the English and the Dutch. . By 1698 the population of the entire Island was 727, including about 70 slaves, growing steadily to 1,279 (1712), then 2,073 (1746) to reach 3,000 at the time of the American Revolution. However, I think the Perliers lived in the Fresh Kills section of Staten Island on the west side of the island. 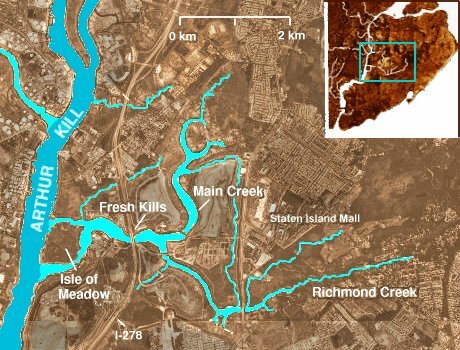 Fresh Kills (from the Middle Dutch word kille, meaning “riverbed” or “water channel”) is a stream and freshwater estuary in the western portion of the of Staten Island. It is the site of the Fresh Kills Landfill, formerly New York City’s principal landfill. The watershed of the Fresh Kills drains much of the wet lowlands of the western portion of the island and flows into the Arthur Kill around the Isle of Meadows. The channel around the north end of the Isle of Meadows is sometimes called Little Fresh Kill and the southern channel is called Great Fresh Kill. The stream has two major branches. The north branch is Main Creek. The south branch is Richmond Creek, which drains much of the central part of the island, with its headwaters near Historic Richmond Town Currently, the New York City Department of Parks and Recreation is in the process of planning a new park on the former landfill site..
An unrecorded will, dated Oct. 28, 1723, stated I, John Perle, of Staten Island, being very sick, etc. I leave to my sons, Joh, Peter and Abraham, all my lands and plantation. I leave all my movable estate to my six daughters, Ann, Elizabeth, Mary, Sarah, Esther and Martha. Occupation was that of a carpenter. It has been told that he once owned the land that the Woolworth building now stands on in New York City. Jean served in the French and Indian War in 1711 and in the South Company of the local militia in 1715. His will was probated October 28 1723. Marie was baptized 25 Feb 1700; Witnessed by her grandparents Rene Rezeau and Anne Coursier. This was a year later than the date traditionally given for her birth, 2 Feb 1698/99, so maybe there was a problem with interpreting the double dates. Anne’s husband Charles Petit was born in 1697 in New York. Susannah’s husband Henry La Tourette was born 1708 Fresh Kills, Staten Island, Richmond, New York. His parents were Jean La Tourette (1651 Osse, France, – 1725) and Marie Mercereau (Mersereau) (1670 – 1733). After Susannah died, Henry married 28 Sep 1764 Staten Island to Sarah Lane (b. ~ 1729 – d. 1806 in Bound Brook, Middlesex, New Jersey). Sarah first married Stephen Wood. Henry died 30 Dec 1794 Fresh Kills, Staten Island, Richmond, New York. Henry’s parents lived in a castle in France in the Pyrenees in Osse (Oise-en-Bearn). The castle was located at the top of a mountain overlooking the town. Only a portion of the building remains. The LaTourettes were people of wealth and position which made them that much more vulnerable. When the Edict of Nantes was revoked by King Louis XV, Jean and Marie knew their days were numbered. They gave a large party and, while the guests were having a good time, they slipped away with only the clothes they were wearing; the family bible and jewels. Preparations had been made ahead of time to engage passage on a ship sailing to the New World. Perhaps they shipped some of their personal belongings to the seaport some time in advance of sailing. Members of Marie’s family, the Mercereaus were also on board. Not long after their arrival, there is an entry in the records of the French Church in New York City that Jean and Marie were married (July 16, 1693) and, shortly after, their daughter Mary (Marie) was baptized (Dec. 6, 1693). It is believed Jean and Marie were married in France but the Edict of Nantes expressly declared that all marriages and baptisms of Huguenot preachers were null and void. Authorities also destroyed all the records in the Huguenot churches. Therefore, Jean and Marie married under English law when they arrived and also, thereby, gained citizenship in this nation. They bought property on Staten Island and very soon became involved in local affairs. The original house became a part of the LaTourette golf course, which is still in existence. There is also a LaTourette Museum on Staten Island. Henry LaTourette was a weaver by profession, a coroner for Staten Island Warden for St. Andrews, loaned on mortgages in Staten Island, and New Jersy, and accumulated considerable property which he left his children. He was twice married. The mother of his children was Susanne Parlier, the names of his children compared to those of the Parlier Family; In 1760, Henry LaTourette records a satisfaction of a mortgage on Peter Parlier land dated 1745 about the date of Henry’s first marriage; he records all of his land on Fresh Kills; since no consideration is given in the Parlier mortgage, it is possible this property came to Henry LaTourette as a dowery with his first wife Susanne Parlier. Henry was probably buried at St. Andrews were he was warden and custodian of the records through the period of the War of the Revolution. Henry the Weaver appears frequently as executor of wills and as witness; as mortgages, grantee. A series of deeds recorded in 1760 indicated that he acquired from his brothers all the original estates left by their father on Fresh Kills; he purchased from neighbors plots adjoining his farm. On Jan. 24, 1737, there is a joint will signed by Henry and his brother James; it is probated in 1738 after the death of James and provides that his property should go to the survivor of the two brothers. Evidently James was not in good health and the will was made to protect their joint weaver business, their mills and lands. Henry LaTourette adds to these lands in 1739 adjoining land of James Egbert, miller; he buys another plot from James Egbert in 1744; he adds the Parker lot in 1743; his brothers-in-law Samuel Broom and Jan Van Pelt deed their portions to him. He made a violin now in the hands of the LaTourette in Covington, Indiana (1935). It has the date carved 1770. In 1771, Henry LaTourette writes to the governor asking to be relieved of the post of coroner; the records show many fees paid him as coroner from 1763 till 1784.
i. Susannah La Tourette b. 23 Mar 1743 in Staten Island, Richmond, New York; d. 1811 in Bergen Point, Bergen, New Jersey, m. 1764 to Peter Cole and named her oldest child Susanne Parlier Cole. iii. John G La Tourette b. 3 May 1749 in Staten Island, Richmond, New York; d. 22 Feb 1813 in Staten Island, Richmond, New York; m1. 1777 to Elizabeth Bond (b. 1755 in Manchester, England – d. 8 Jul 1798 Staten Island, Richmond, New York) Elizabeth’s parents were William Bond and [__?__]. John and Elizabeth had ten children born between 1775 and 1795.
iv. Ann LaTourette bapt. 28 Jan 1751 Fresh Kills, Staten Island, Richmond, New York; d. 25 May 1843 Monmouth, New Jersey; m1. 05 Oct 1777 at Trinity Church, New York City to Abraham Canon (b. 1751); Ann and Abraham did not have children. m2. 30 Dec 1780 to William De Groot (b. Jul 1751 at Raritan, Somerset, New Jersey – d. 29 Aug 1840 at Bound Brook, Somerset, New Jersey) William’s parents were Johannes De Groot (1724 – ) and Aeltje Olden (1721 – ). Ann and William had three children. v. Peter LaTourette b. 17 Jul 1754 in Staten Island, Richmond, New York; d. 23 Jan 1831 in Vestal, Broome, New York; m. 1782 Wayne, Pennsylvania to Elizabeth Androvette (b. 14 Mar 1760 in Staten Island, Richmond, New York – d. 25 May 1838 in Vestal, Broome, New York) Elizabeth’s parents were Peter Androvette (1731 – 1802) and Catharine Nichols (1735 – 1797) Peter and Elizabeth had ten children born between 1783 and 1799. 23 Jun 1779 Age: 24 – Captured Colonel Christopher Billop and put him in jail. Christopher Billopp (1738 – 1827) was a British loyalist who commanded a Tory detachment during the war, earning him the sobriquet, “Tory Colonel”. After the American Revolution he emigrated to New Brunswick, Canada along with other United Empire Loyalists and represented Saint John in the 1st New Brunswick Legislative Assembly. LaTourette captured Billopp when he rowed across the Arthur Kill from Perth Amboy, New Jersey. Billopp was held as a P.O.W. in the Burlington County, New Jersey jail, where he was chained down to the floor and fed a diet of bread and water by order of Elias Boudinot, appointed by Congress as Commissary General of Prisoners. He was informed that his harsh treatment was in retaliation for the suffering of John Leshler and Captain Nathaniel Fitz Randolph of Woodbridge, New Jersey, being held by the British. Fitz Randolph would later be killed in the Battle of Springfield. To the Keeper of the Common Jail for the county of Burlington. Greeting. “You are hereby commanded to receive into your custody, the body of Col. Christopher Billop, prisoner of war, herewith delivered to you, and having put irons on his hands and feet, you are to chain him down to the floor in a close room, in the said jail; and there so detain him, giving him bread and water only for his food, until you receive further orders from me, or the commissary of Prisoners for the State of New Jersey, for the time being. Given under my hand at Elizabeth Town, this 6th day of Nov. 1779. “Sir, Sorry I am that I have been put under the disagreeable necessity of a treatment towards your person that will prove so irksome to you; but retaliation is directed, and it will, I most sincerely hope, be in your power to relieve yourself from the situation by writing to New York, to procure the relaxation of the sufferings of John Leshler, and Capt. Nathaniel Randolph. It seems, nothing short of retaliation will teach Britons to act like men of humanity. “I am, sir, your most humble servant, “ELIAS BOUDINOT, Com. S. Pris. “Elizabeth Town, Nov. 6, 1779. Another prisoner being held in the Burlington jail at the same time was John Graves Simcoe of the Queen’s Rangers, who led the massacre of patriots in the Wiliam Hancock house in Salem, New Jersey, and embarked on a raid into New Jersey, dubbed “Simcoes Raid”, from “Billop’s point”, as Christopher Billop’s land was known. It was upon this raid he was captured and imprisoned with Billop. I was allowed my parole, was taken from it the 9th, and have ever since been confined a close prisoner in Burlington gaol, with Col. Billop, who is in irons and chained to the floor, to retaliate for F. Randolph and Leshier, the latter of whom is (said to be) confined in the same manner in New-York: my mittimus hath not expressed what I am imprisoned for; but, by the tenor of Governor Livingston’s letters, I suppose it is to retaliate for the former of those citizens, whom he allows to be a private soldier, and who is simply confined as such. After his last release from patriot imprisonment Billop went back to his manor house and confronted his servants. He was convinced that a 15-year-old servant girl had signalled his presence on the day of his kidnapping by holding a candle by a window on the second floor. This could be seen by the patriots perched in the steeple of St. Peter’s Church in rebel controlled Perth Amboy. According to legend he threw her down a flight of stairs and killed her. His ghost and that of the girl are said to haunt the Conference House, reenacting their deadly struggle. Colonel Christopher Billop‘s home the Conference House is situated on the southernmost point of New York State, this point of land, jutting out into Raritan Bay was known as “Billop’s Point” during the 18th century On Sep 11, 1776, Lord Howe, commander in chief of British forces in America, brokered a meeting with representatives of the Continental Congress in a peace conference aimed at halting the American Revolution. Benjamin Franklin, John Adams, and Edward Rutledge rowed over from patriot-held Perth Amboy, New Jersey. The meeting lasted for three hours and ended with the Americans politely declining Howe’s offer, leading to another seven years of conflict. Pierre’s wife Martha DuBois was born in 1717 in Staten Island. Her parents were Lewis DuBois and Martha [__?__]. Martha died 8 Nov 1789 – Woodbridge, Middlesex, New Jersey. They moved to New Jersey under the name Perlee. i. Peter Parlier bapt. 20 Jan 1740 Staten Island;d. 18 Apr 1781 – Harlingen, Somerset, New Jersey; m. Rebecca Ilsley (b. 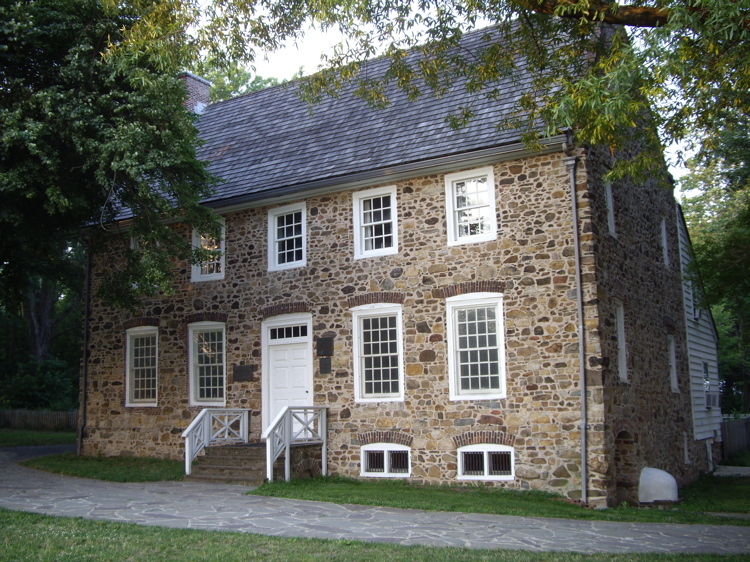 1740 Elizabethtown, New Jersey – d. May 1820) Rebecca’s parents were Benjamin Ilslee (1718 – 1756) and Jannetje Halenbek (1721 – 1756) Peter and Rebecca had eight children born between 1762 and 1780. Abraham’s wife Mary Sleght was born in 1722. Her parents were Hendrick Barentsen Sleight and Catryntje Winans (Winnen). -In the name of God, Amen, November 2, 1760. I, ABRAHAM PARLIER, of Richmond County, being very sick. All debts to be paid. I leave to my wife Mary the use of all my estate during her widowhood. If she marry, she is to have the use of one-third, and she is to bring up my children and give them schooling suitable for them, and when of suitable age they are to be put to trades. The rest of my estate I leave to all my children, Abraham, John, Catharine, Jacob, Henry, Barent and Peter, my executors to sell land at discretion. I make my son Abraham and my friend John Bedell executors. Martha’s husband Joseph Perrine was baptized 25 Aug 1705 in Staten Island, Richmond Co, NY. His parents were Daniel Perrine (1672 – 1745) and Mary Martin (1678 – 1765). Joseph died after 1743. This entry was posted in 10th Generation, Double Ancestors, Huguenot, Immigrant - Continent, Line - Miller, Sea Captain, Storied, Veteran and tagged Huguenots Refugees, Staten Island Pioneer. Bookmark the permalink.